An anti-Semitic and anti-Muslim flier, right, mailed to Garfield residents before last week’s school board elections, has prompted a call for investigation from the mayor and town council. The anonymous mailing attacked three school board candidates, none of whom was elected. “This is reprehensible. Hitleresque,” said Jim Miller, the school board candidate who was portrayed on the flier wearing a yarmulke and Jewish star, alongside a picture of a menorah topped with Miller Beer bottles. It could not be determined how many residents received the mailing, but all were notified before the election. “I actually had a robo-call to the city endorsing those three candidates,” said the mayor. “We quickly changed the wording to condemn the mailing.” He also raised the issue in a pre-election rally the day the fliers were received. Faltas, who was born in Egypt, is Christian, not Muslim as implied by the flier. He served in the U.S. Air Force during Operation Desert Storm, he said. “I want whoever did this to be held accountable and punished accordingly,” he said. DiCostanzo said she had passed the flier on to the county prosecutor’s office for possible investigation. “This is just so foul in my eyes, and unnecessary for a school board election,” she said. Calls to the Bergen County Prosecutors Office were not returned. Neuer of the ADL said the anti-Semitism behind the flier should not be extrapolated to brand Garfield as anti-Semitic. 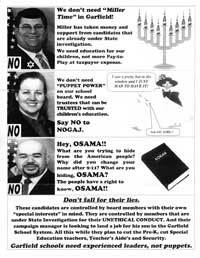 Neuer said he could not recall any similar anti-Semitic campaign literature targeting a Jewish candidate in his five years in New Jersey.